When he’s not controlling crowds in some of the biggest clubs across the globe, Sikdope spends his days in the studio coming up with new ways to revolutionize the scene. This Polish producer started at a young age. Attending one of the top music schools in Poland for more than 9 years has allowed Sikdope to become one of the most versatile producers in the game. From Bass, House to Trap, this DJ/Producer has helped pioneer the sound of electronic dance music today. Sikdope has gained support and recognition from the biggest names in the Industry: Afrojack, Blasterjaxx, Borgore, Carnage, Calvin Harris, Chainsmokers, David Guetta, Dillon Francis, DVBBS, Dimitri Vegas and Like Mike, DJ Snake, Laidback Luke, Nervo, Nicky Romero, R3HAB, Skrillex, Steve Aoki, Tiesto to name a few. 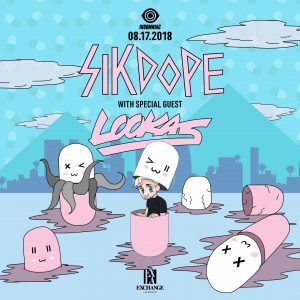 Sikdope will be coming to a town near you! The self-taught Miami upstart first arrived on the scene in late 2013 making major headwaves with his groundbreaking remix of “Tsunami” by DVBBS and Borgeous which was commissioned by Ministry of Sound and released as an official mix in early 2014. With over three million soundcloud plays, the success of the track gained LOOKAS international exposure and major recognition within the dance community. Next followed the noteworthy remix of “War” by Low Rider and the multi platinum-selling single by which he was approached by Flo Rida & Sage the Gemini for “GDFR”. In July 2015, LOOKAS released the original single “Apollo” which has since garnered over two million soundcloud plays. Billboard.com‘s “Next Big Sound” was quick to recognize LOOKAS as one of the top 10 artists on their Rising Artist Chart. Noted for his signature festival trap sound, LOOKAS has been asked to perform at top music festivals including Electric Daisy Carnival Las Vegas, Tomorrowworld, Beyond Wonderland SoCal, Safe in Sound, and Bassrush. He has toured as a feature artist on the hugely popular “paint party” Life in Color, and performed as a headliner at the iconic New York City venue, Webster Hall. LOOKAS recently sold out both hometown shows in Miami. Despite a busy touring schedule, LOOKAS has been active producing quality originals and superb remixes including a forthcoming official remix for Dillion Francis and Skrillex’s “Bun Up the Dance,” coming soon.